Truth is, there is precious little of value in most network newscasts these days. TV news is mostly a string of easily digestible three-minute or four-minute bits that nibble around the edges of substance. The short video stories on ABC News, which are one of the central attractions of the free app for the iPhone and iPod Touch, are no different. I Saw the News Today, Oh Boy: You can watch select segments from various news programs with the ABC News app. The ABC News app replicates much (but not all) of the content network’s Web site. You can view select segments from the network’s various news programs, including Nightline, 20/20, Good Morning America and the Nightly News. Incredibly, I discovered that a few of the videos don’t actually play. The app uses the phone’s geolocator function to offer news and weather from your local ABC affiliate. Of course, you can get a weather forecast just about anywhere—the ABC News app has the neat addition of radar images. Alas, the app is missing the one section that makes the ABC News Web site worth visiting: The blogs. Rick Klein’s “The Note,” “The Radar” and especially Jake Tapper’s “Political Punch” are what keep me coming back to ABC News’s site. Without the blogs, the app feels truncated somehow. I hope ABC adds a blog section in a future update. 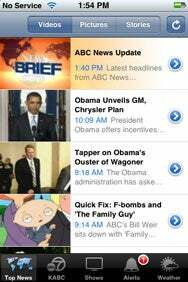 ABC News compatible with any iPhone or iPod Touch running the iPhone 2.x software update.